How do I connect a drive-away awning to my VW T5 campervan? Which awning drive-away kit do I need for my VW California rail? 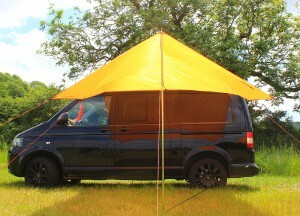 What’s the best way to attach an awning to a VW T4? These are Bus questions that we get asked all the time, so whichever post 90’s model VW Transporter you own, T4, T5 or T6, we’ll talk through the connection options in this post. For earlier VW Vans see our How to Connect a Vango AirBeam Awning to a VW T2 Bay, Splitscreen or T25 post. 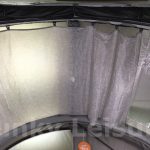 What is an Awning Drive-Away Kit? 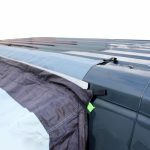 Drive-away awnings are supplied with two basic ways to attach the awning to a van without an awning rail fitted – Throw-Over Straps and Roof Bar Tabs. 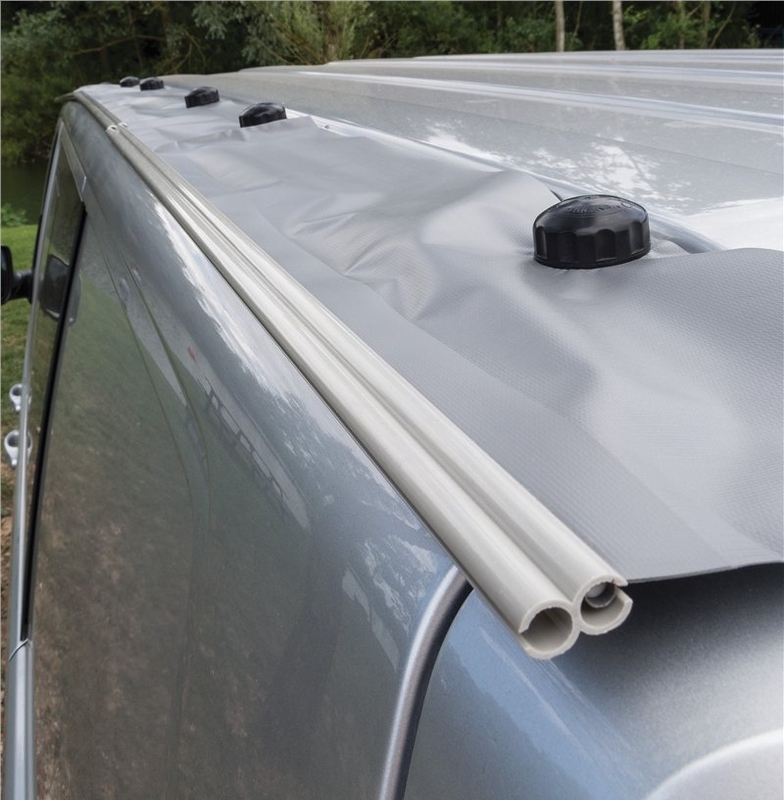 If your van has a C-profile type awning rail fitted, the Kador beading on the top edge of the awning connection tunnel can be slid directly into it before pitching the awning. 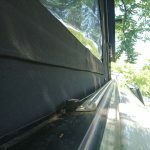 This connection method is fine if you don’t plan to drive the van out while your awning is pitched. To drive a vehicle out from a pitched awning is definitely a two-person job and a very awkward manoeuvre which we don’t recommend attempting. One person has to hold the awning Kador whilst the driver tries to drive straight out without tearing the expensive new awning or running over the other persons feet. You then have to try to do it all again when you attempt to connect up again… maybe in the dark! An awning drive-away kit allows one person to easily detach from the awning in just a couple of minutes and drive the van out for the day. 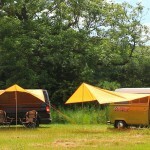 It only takes 2 or 3 minutes for one person to drive back into position and reconnect to the awning. Top Tip: always mark your position on the driver’s side before driving away. Use a Drive-Away Awning Guidance Strip or peg a guyline next to your tyres (approx. 5cm from the edges). 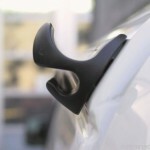 Peg the front of the marker at your front wheel centre so you know exactly where to stop. 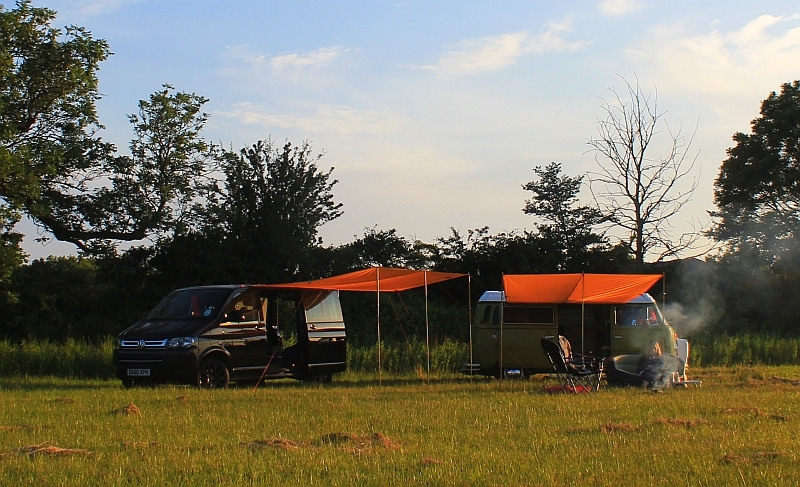 Yes, there are quite a few different awning connection options depending on the configuration of your vans roof and whether you have an awning rail or wind-out canopy fitted. We think we’ve pretty much covered every Volkswagen Transporter van set up below so just scroll down the blue titles until you find yours. 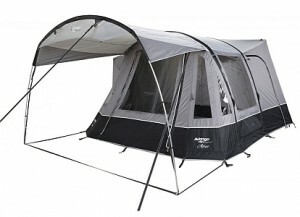 All Vango, Kampa and Outdoor Revolution drive-away awnings are supplied with either adjustable throw-over webbing straps or guylines which clip-in/tie into the top corner edges of the awning connection tunnel. This is a quick and easy way of connecting to any van that doesn’t have an awning rail fitted. 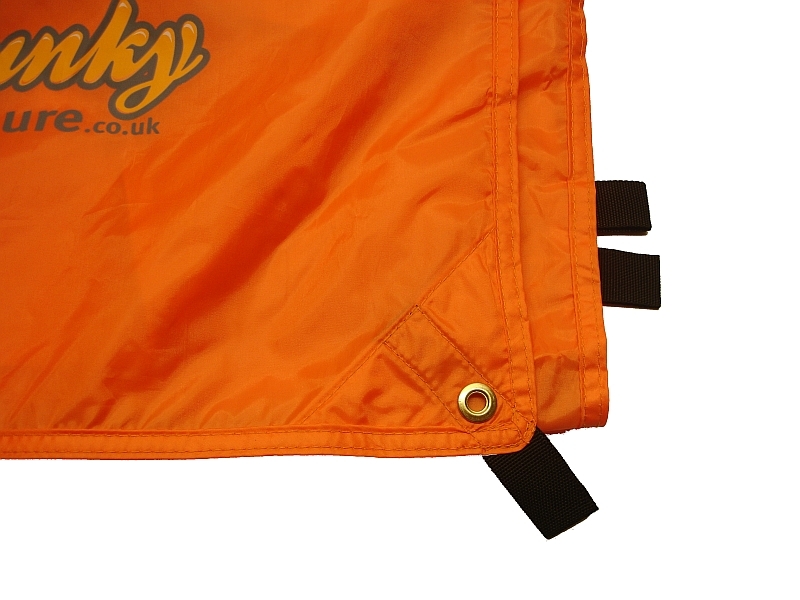 Many of our drive-away awning customers are happy to use the throw-over straps indefinitely or at least try them a few times before thinking about having a rail fitted. 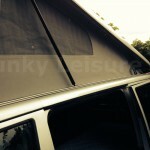 Simply position the adjustable straps over the top of the van roof and peg them down on the other side. Top Tip: if it is very windy and you are concerned about the straps rubbing on your vans paintwork, you can use a couple of tennis balls with a cut halfway through or short lengths of foam pipe lagging to protect the edge of the roof. 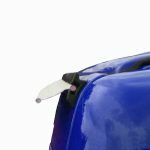 Alternatively, a Limpet Suction Drive-Away Kit or Magnetic Drive-Away Kit can be used to attach to flat or very slightly curved surfaces of the van roof. These sort of kits have been much improved over recent years and can provide a more weather tight connection between the awning and van edge. 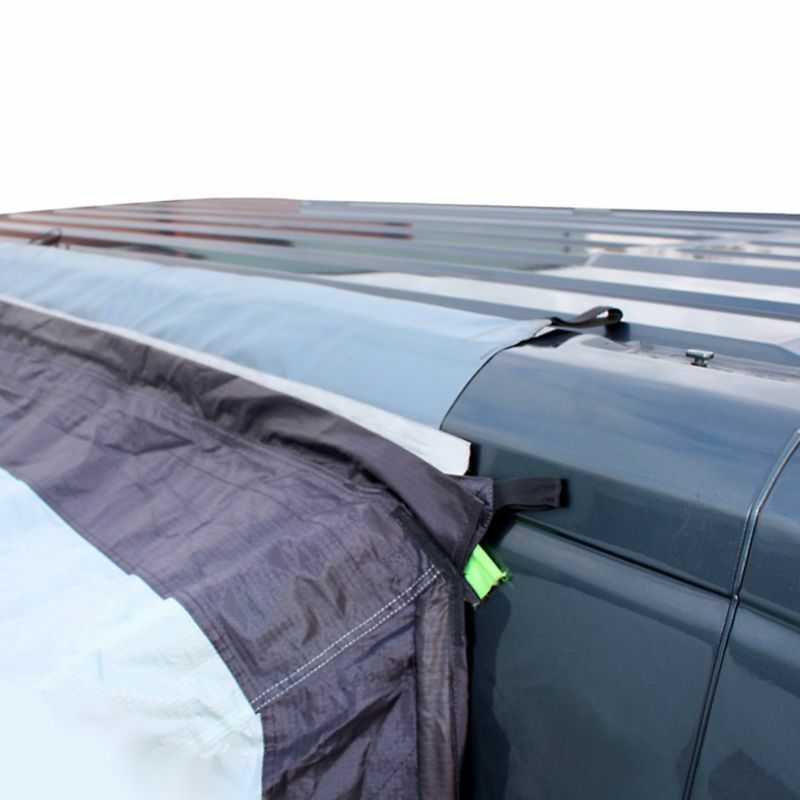 The throw-over webbing straps can still be used on vans with an elevating roof as they are spaced about 2.5m apart on the awning connection tunnel allowing them to be positioned around the front and rear of the Pop Top. Simply peg them down on the opposite side of the van and adjust the tension. Unfortunately, Limpet Suction and Magnetic Drive-Away Kits will not secure onto the curved outside corner edge of a VW Transporter roof. All Vango, Kampa and Outdoor Revolution drive-away awnings have 2 or 3 hook and loop Velcro tabs sewn in to the top edge of the connection tunnels. 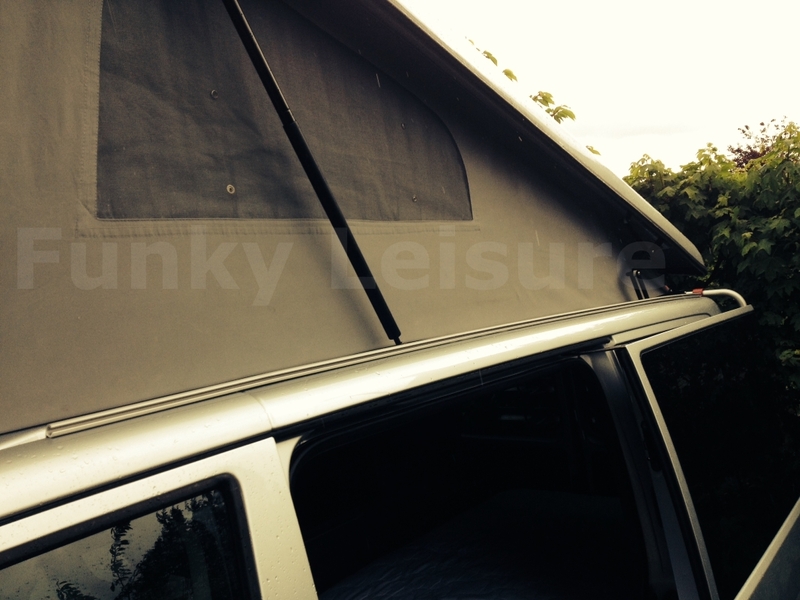 If you have roof bars or a roof rack fitted to your van, simply attach the awning to them using the Velcro Tabs. 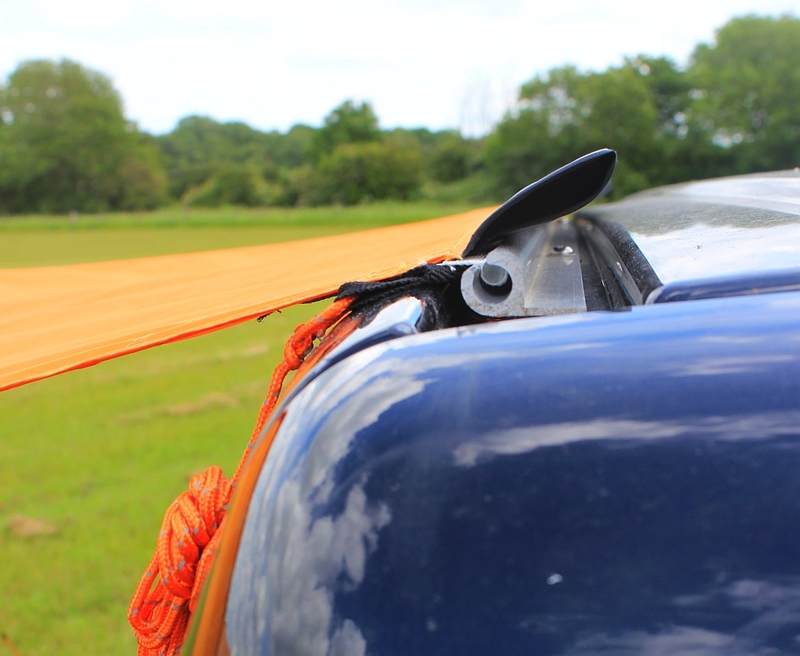 You can take a ‘belt and braces’ approach and use the roof bar tabs in conjunction with the throw-over webbing straps which can be either pegged down as above or tied to the other roof bar. 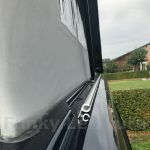 As with the throw-over straps, many of our customers are happy to use the roof bar tabs connection indefinitely or at least before considering having an awning rail fitted. Unfortunately, Limpet Suction and Magnetic Drive-Away Kits will not secure onto the curved outside corner edge of a VW Transporter roof. Roof bars also tend to lever them off if they are positioned towards the middle of the roof. Top Tip: if you would like to make the connection a bit more weathertight, a couple of lengths of foam pipe lagging can be used to block the gap between a van roof and the roof bars. 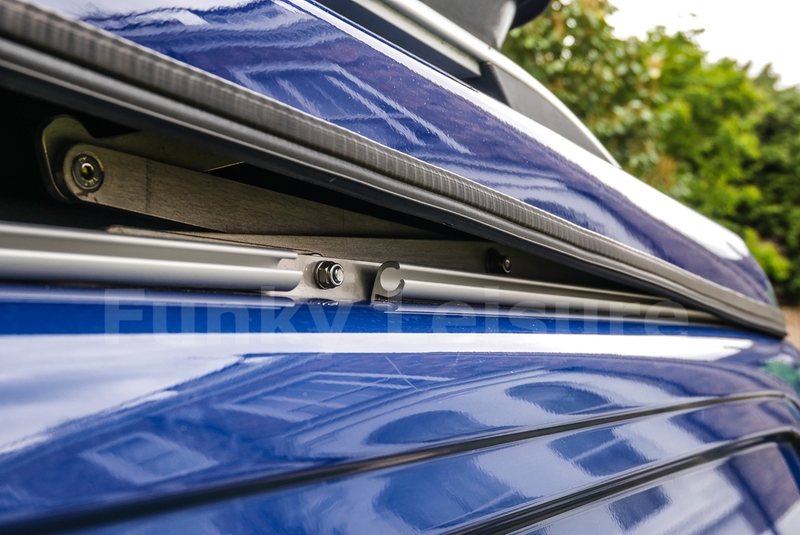 If you would like to find out more about choosing and fitting an awning rail to a van with roof bars – see our How to fit a C-Channel C-Profile Awning Rail to a VW T4, T5 or T6 post. 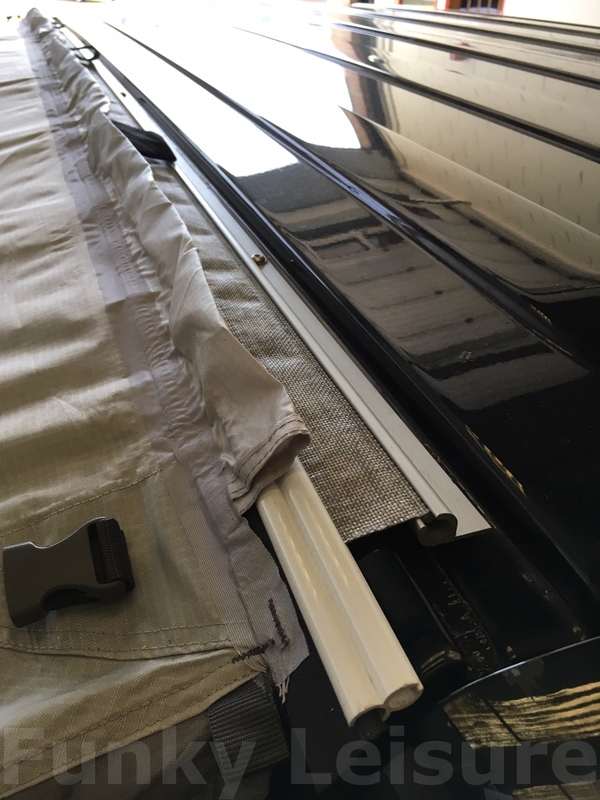 If your van has a Reimo Multi-Rail or C-channel awning rail fitted, you can use a standard 6mm to 6mm Drive-Away Kit to connect an awning. The kit includes 1 x 3m length of Twin Kador and 3 x lengths of Figure of 8 plastic extrusion. Slide the Figure of 8 onto the drive-away awning and then slide the Twin Kador into the rail and the other channel of Figure of 8 to connect. Simply pull the Twin Kador out to detach and drive away. 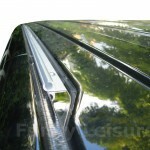 The aluminium T-channel rail is fitted to most VW California roof as standard. 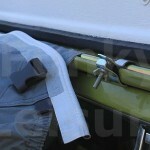 These rails are also available as an aftermarket product so can also be found fitted onto any other converted VW van. 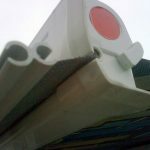 This aluminium T-rail is designed for mounting a cassette type wind-out sun canopy on (see below section) or a rubber multi-rail insert that slides in to create an awning connection. We have had many customers over the years that haven’t known about this additional rubber insert part and have been frustrated that standard 6mm Kador pulls out of the aluminium T-rail. There have been issues with the rubber insert that have been well documented over the past few years on various VW forums and we too have had quite a few frustrated, mainly VW California customers. As the insert is made of rubber, the C-profile section can flex and release standard 6mm core Kador… we have even experimented with larger diameter Kador and this too pulls out. It is not unusual for the connection to feel okay and then pull out overnight in windy conditions or during the day when the rubber heats up in the sun. If you have the rubber insert fitted and are concerned about the C-profile not retaining the Kador style drive-away kit, we recommend using a Pole & Clamp Drive- Away Kit as an alternative. 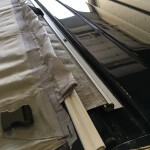 The pole slides through a pole sleeve on the awning connection tunnel and sits in the top gutter part of the rubber insert, it is then secured with the clamps. We have many Customers who are happy to use this connection method as it is quick and easy to attach. 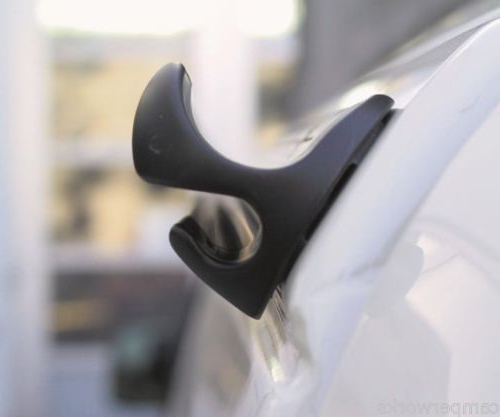 If your van just has the aluminium T-rail or you have the rubber insert but would prefer to connect directly to the aluminium rail, you can use 6mm to 7mm Twin Kador with 3 x lengths of Figure of 8 Channel as a drive-away kit. Our custom diameter Twin Kador will slide directly into the T-rail and stay secured… cutting out the need for the expensive rubber insert. 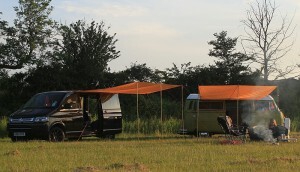 Many VW Campers have a Fiamma, Thule Omnistor or Domectic cassette type ‘wind-out’ sun canopy mounted onto the aluminium T-rail. Most of these wind-out sun canopies have a small diameter C-profile on the front leading edge… sometimes you need to wind the canopy out slightly to see it. 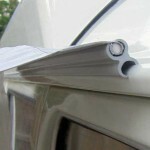 A 6mm to 4mm Drive-Away Kit is usually used to connect an awning into this C-profile channel. We come across the occasional unbranded wind-out sun canopy with a larger diameter C-channel that is compatible with a standard 6mm to 6mm drive-away kit. If in any doubt measure the diameter; a channel of approximately 6mm – use a drive-away kit with 6mm to 4mm Kador beading (4mm core = overall diameter 5mm) and a channel of approximately 8/9mm – use a drive-away kit with 6mm to 6mm Kador beading (6mm core = overall diameter 7mm). 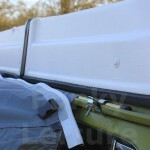 Top Tip: if there is a space beneath your wind-out sun canopy and the vans roof, you can make the connection a bit more weathertight by using a couple of lengths of foam pipe lagging to block the gap. J-rail, J-profile rail or similar is sometimes fitted to high-top vans and T4’s to create a simple lip. You can connect an awning onto the lip using Figure of 8 Channel – slide 3 x lengths onto the awning Kador and hook it over the J-rail lip. 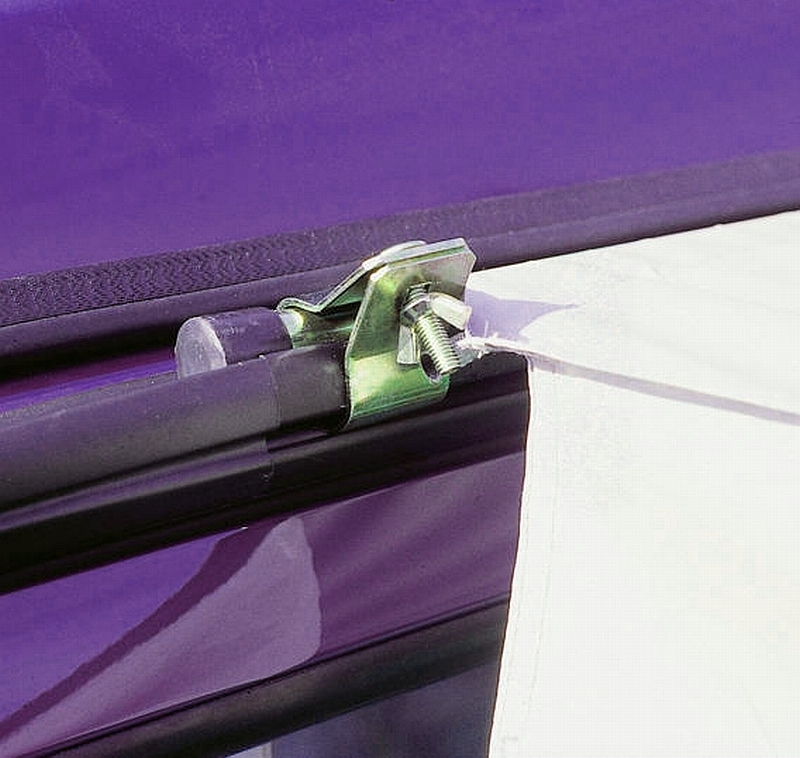 This method does rely on the tension of the fabric pulling away from the van to stay attached and can sometimes come off in windy weather. 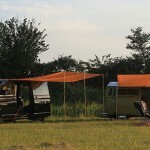 We hope this blog page will help you and your drive-away awning to connect better with your Dub! 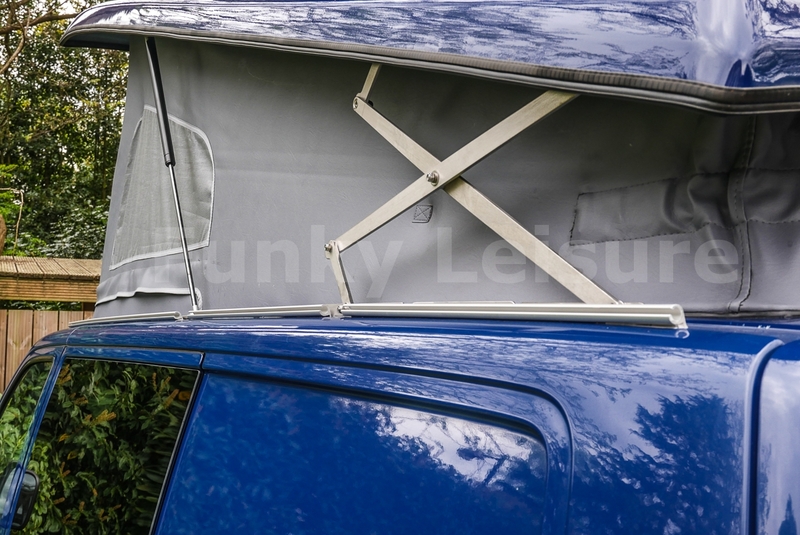 The most secure and weathertight way of connecting a drive-away awning to a VW T4, T5 or T6 is to fit a C-Channel Awning Rail and connect via an Awning Drive-Away Kit. 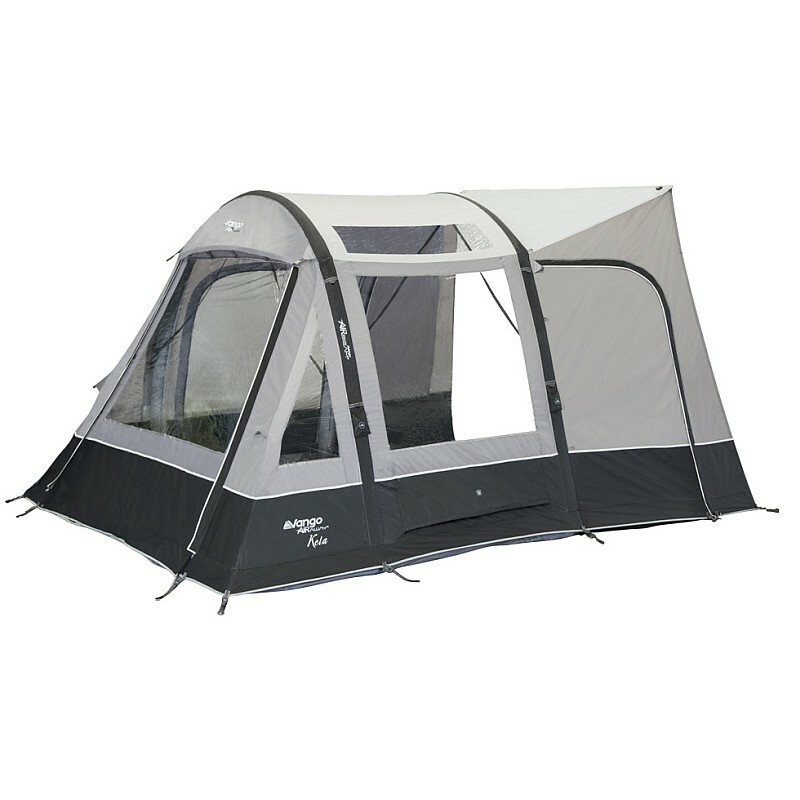 Sun canopy awnings will also slide directly in to a C-profile type rail. How Do C-Profile Systems Work? 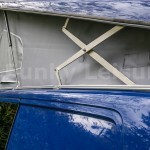 C-channel describes the ‘C’ profile of an awning rail which is either fitted to the side edge of the roof or into the roof gulley of a Volkswagen Transporter. Which C-Profile Rail Should I Fit? There are a few different types of C-profile rails on the market and they differ significantly in price, fitting position and how they’re fitted. 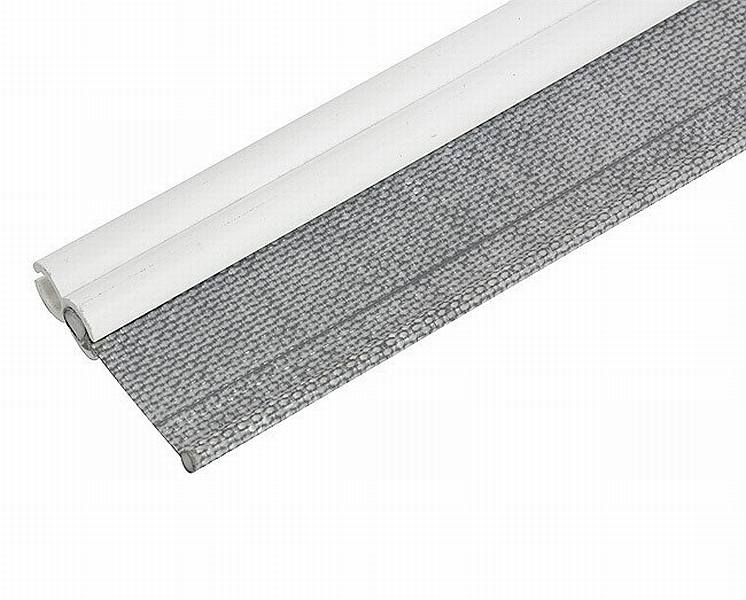 These rails can be put into two categories C-channel awning rails and multi-rails which incorporate a C-profile rail. Use the information below to make an informed decision on which rail would be right for your particular Bus. 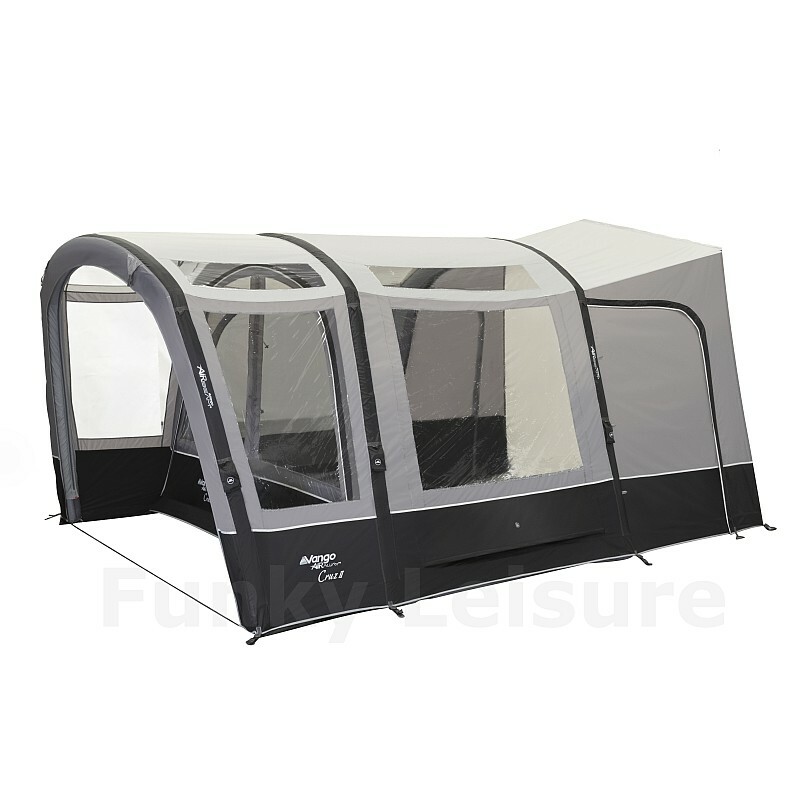 The more expensive options are the multi-rail type awning rails which are either bonded or screwed or bonded and screwed to the edge of the roof just above the top of the doors. These rails are known as multi-purpose because a drive-away awning can be connected using either the C-channel with a Kador Drive-Away Kit or via the gutter using a Pole & Clamp Drive-Away Kit. 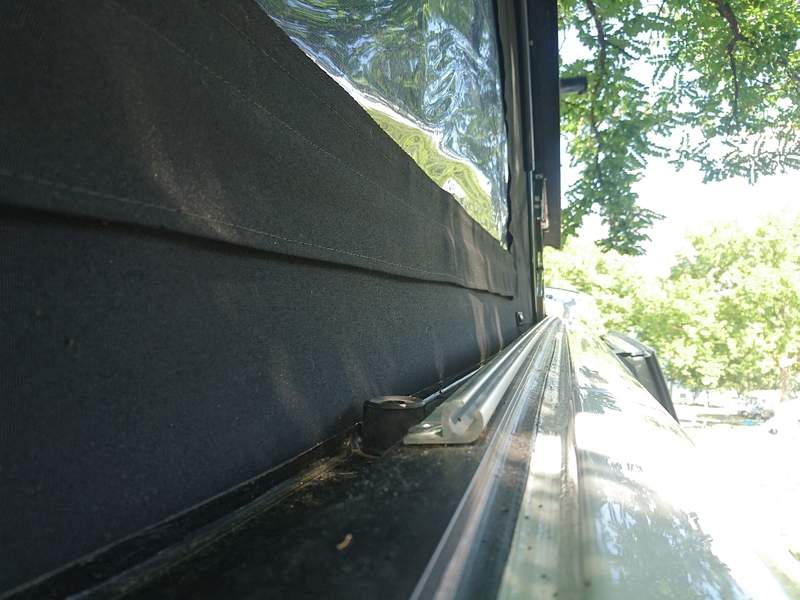 Some manufacturers also claim these rails disperse rainwater… although we feel this is a negligible amount as the side roof gully will usually disperse the majority of roof rainwater on most vans. 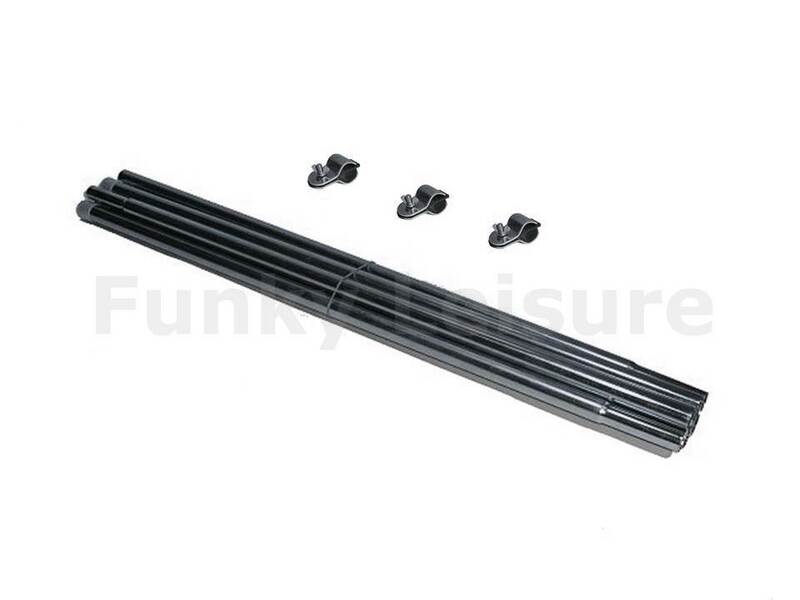 These rails are normally very good quality and come in either their natural anodised aluminium finish or in matt/satin black with plastic end stops. 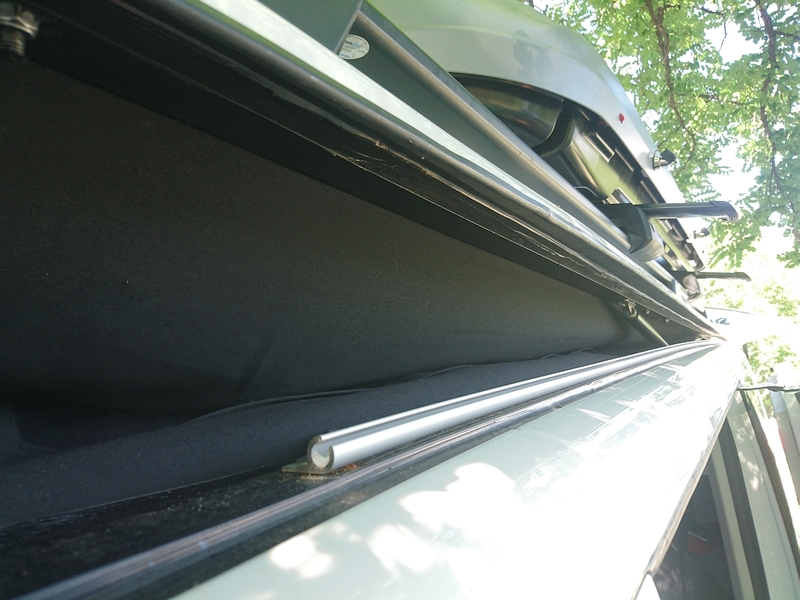 If you’re confident… and capable enough, multi-rails can be DIY fitted, although most owners tend to get them fitted by a VW conversion company or vehicle body shop. 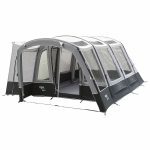 One of the most popular awning multi-rails is the Reimo Multi-Rail which at the time of writing costs approximately £220 + £50 fitting. 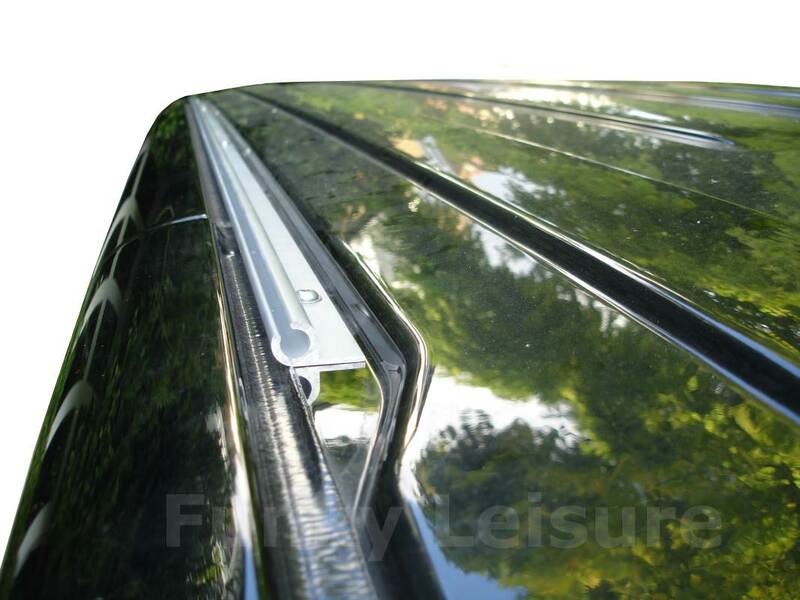 Important: the Volkswagen multi-rail fitted to most VW California campers has a rubber C-profile insert that is sold as a separate part to the aluminium rail itself. 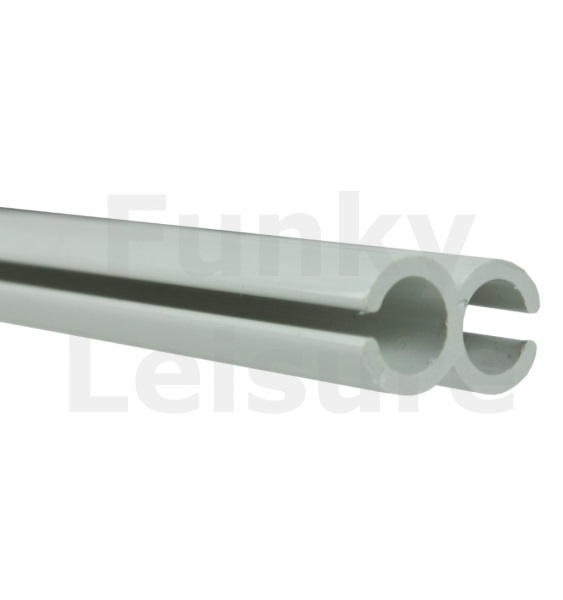 The insert part slides into the rectangular profile of the aluminium rail, however, the C-profile part of this rail does not retain 6mm core industry standard Kador as used in all drive-away awnings, sun canopies and awning drive-away kits. 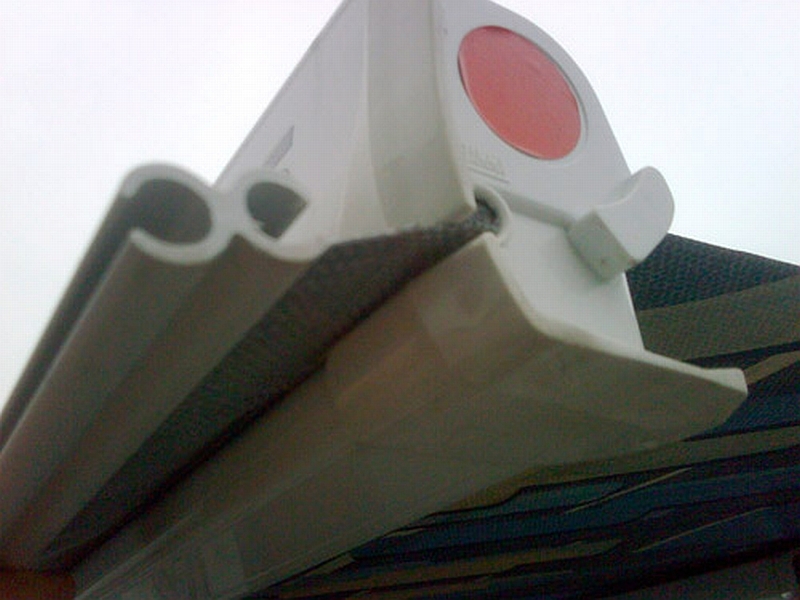 We therefore recommend using a Pole & Clamp Drive-Away Kit in the top ‘gutter’ part of the insert to connect. 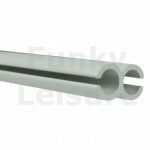 Alternatively, buy a length of 6mm to 7mm Kador Connector and 3 x lengths of Figure of 8 Awning Channel. Slide the Figure of 8 onto the awning tunnel Kador and then slide the twin Kador connector into the Figure of 8 with the larger 7mm side sliding directly into the aluminium T-channel rail. If you haven’t bought the £90 rubber insert already, this connection method will save the cost of buying the expensive and often problematic part. Pros: High quality anodised aluminium, good fitting position for use with a drive-away kit and can be used with a 6mm Drive-Away Kit or Pole & Clamp Drive-Away Kit. 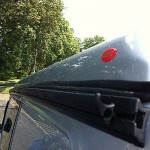 Cons: Expensive, rail is always visible and the side of your van will need to be drilled or have adhesive used on it. The rubber C-profile insert of the VW California rail is too flexible and will not retain camping products fitted with standard 6mm or larger diameter core Kador. C-Channel Awning Rails are available in stainless steel or anodised aluminium finish and are normally much cheaper to buy than multi-rails. The quality varies from cheap, thin gauge caravan type rails to high quality, heavy gauge anodised aluminium… so choose carefully! 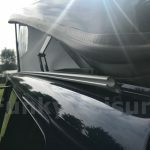 C-channel can be fitted inside the roof gully of a VW T5 or T6 using the existing roof fixings to connect – happy days no drilling into your Bus required! As T4’s don’t have any fixings in the roof gully a C-channel awning rail will have to be bonded into position. 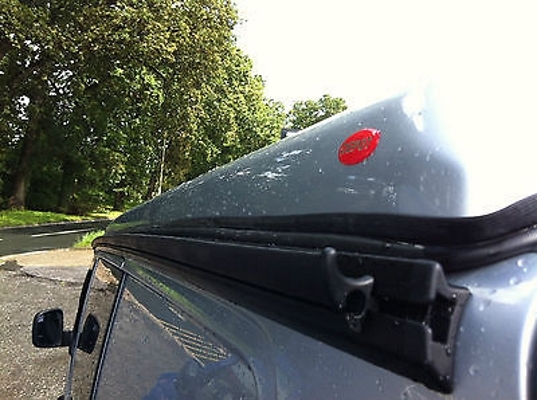 Whichever van you have, if your roof gully is free to use this is a great option as it won’t change the look of your van at all – the rail is concealed in the gully. 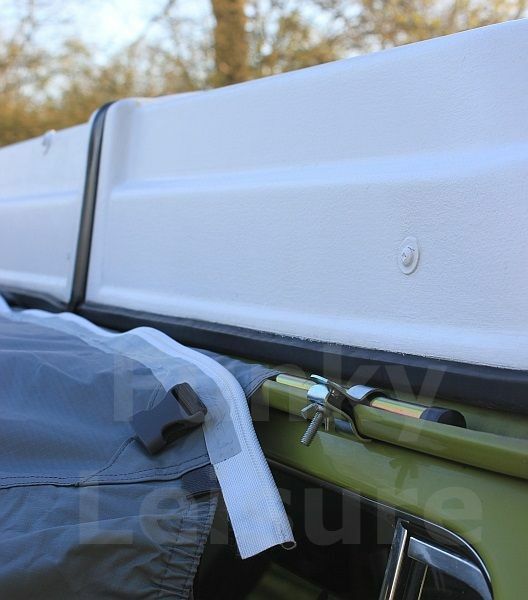 If you have a VW Campervan with an elevating roof, the roof gully fixings will be already used for the scissor hinge and gas strut of your ‘Pop Top’. 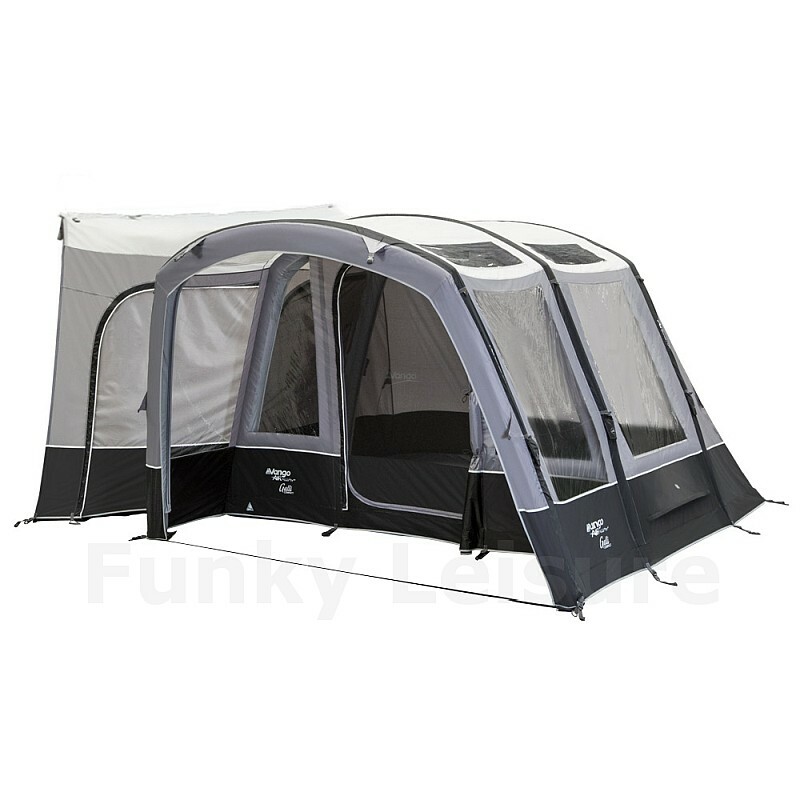 In this case a C-Channel Awning Rail can usually be bonded vertically to the side of the roof gully just in front of the hinge and strut so it is concealed when the elevating roof is closed – see bottom section for more details. It becomes a bit trickier to fit C-Channel to a van with roof bars as the roof bar brackets use the roof gulley fixings to connect. If you have chrome or stainless steel chunky roof bars that have bolt on fixings at each end, it is possible to fit a 209/210cm rail (for SWB) in between the bars using the end fixing bolts. 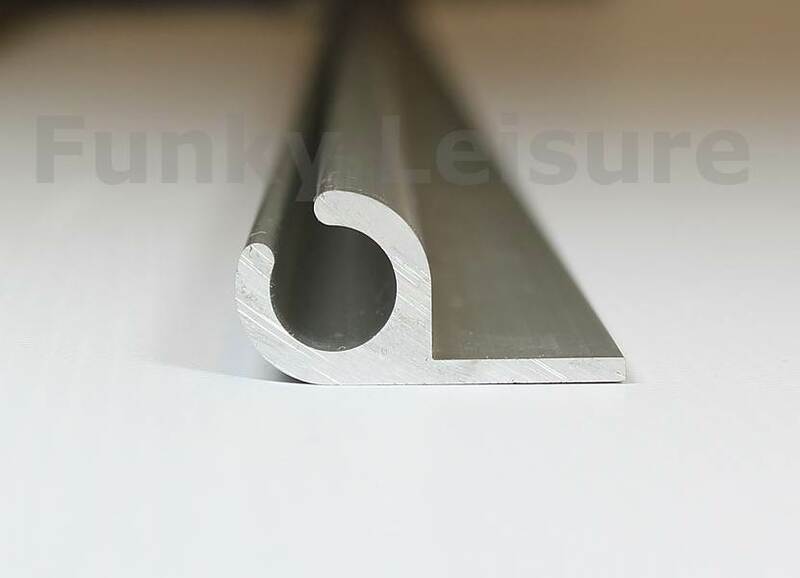 There are some stainless steel C-profile rails on the market that have an additional wide fixing base for sandwiching under roof bar brackets, the rail then angles out of the gully just above the roof line. 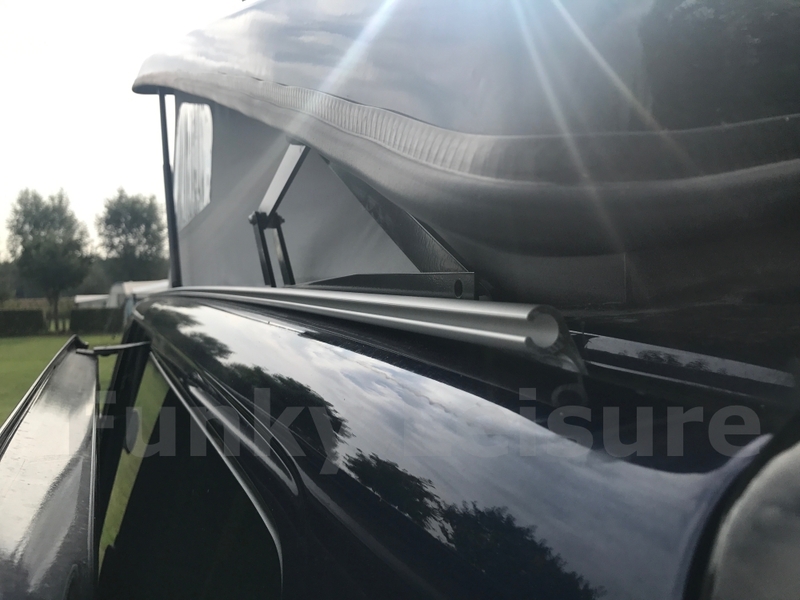 Our anodised aluminium C-Channel Awning Rail is high quality 3mm gauge, German made and currently retails for £40 (for a 2.4m length suitable for a SWB VW T5). Pros: Inexpensive, low profile, high quality anodised aluminium with concealed fitting in roof gulley or under elevating roof. No drilling of van necessary – easy to fit. Cons: Awkward to fit with roof bars and some of the stainless steel caravan type C-rail on the UK market is thin gauge and looks cheap. 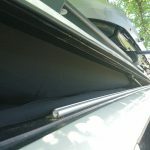 What Length of C-Channel Awning Rail Do I Need? 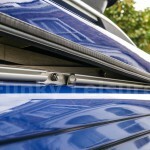 The Kador connection on most drive-away awning connection tunnels is around 250cm in length but your C-Channel Awning Rail can be shorter than this as the Figure of 8 extrusions of the drive-away kit are made from rigid plastic. 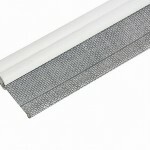 The Figure of 8 extrusions can extend out up to 25cm further than the end of you rail and still keep the connection tunnel fabric nice and taught – so 200cm is probably the minimum length of C-Rail needed to connect most drive-away awnings. Although it is always preferable to fit C-Channel in one length, it can be fitted in two shorter lengths with a small bracer glued behind to ensure the join lines up properly. These instructions can be used to fit a C-Channel Awning rail to a van that has the roof fixings available to use (no elevating roof or roof bars fitted). The rail initially takes 15mins to fit and can then be removed and refitted in just 2mins. Remove the existing roof blanking bolts, stick some masking tape to the inner edge of the roof gulley (closest to the centre of the roof) and with a mark the centres of the fixing hole positions across on to the tape with a pencil. Position the C-Channel on the roof approximately 3cm from rear door/s and carefully mark the bolt hole centres from the masking tape across to the rail. Mark the hole centres at an equal distance from the rail edge and drill 8mm holes in the rail – use a centre punch or nail in the centre of your mark to stop drill wander. Secure the C-Channel using stainless steel pan-head bolts and washers. The front and rear 40cm of the rail can be given a gentle bend downwards of 15/20mm to follow the curved profile of the roof. These instructions can be used to fit a C-Channel Awning rail to a T4 van without an elevating roof or roof bars/rack. Lay the C-Channel rail in the roof gully approximately 5cm from the rear doors with the C-profile against the outer edge of the roof gully and stick a few pieces of masking tape on the van roof to mark the edges of where the rail is positioned. Mark the front and rear of the rail with a pencil approximately where the roof profile starts to curve downwards. Gently bend the front and rear 40cm of the rail downwards 15/20mm to follow the curved profile of the roof. Two parallel strips of masking tape can be stuck along the length of the roof gully to protect paintwork from any excess adhesive. Follow the guide pieces of tape and leave a 30mm gap where the rail will be positioned. 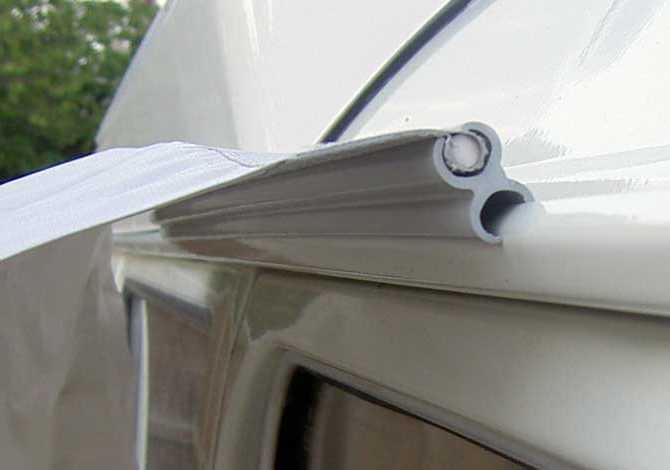 Use Sikaflex 221 or similar automotive adhesive to bond the rail to the roof – apply a bead along the length of the gully and position the C-Channel rail. Wipe away any excess adhesive and apply a few strips of masking tape to keep the rail in position. Weight the rail where necessary and allow at least 24hrs+ for the adhesive bond to cure properly – always follow the adhesive manufacturer’s instructions. *Please note: it is important to position the rail towards the rear of the van to allow enough room for the sliding side door to open fully without snagging on a drive-away awning connection tunnel. These instructions can be used as a guide to fit a C-Channel Awning rail to a T4, T5 or T6 van with a Pop Top. 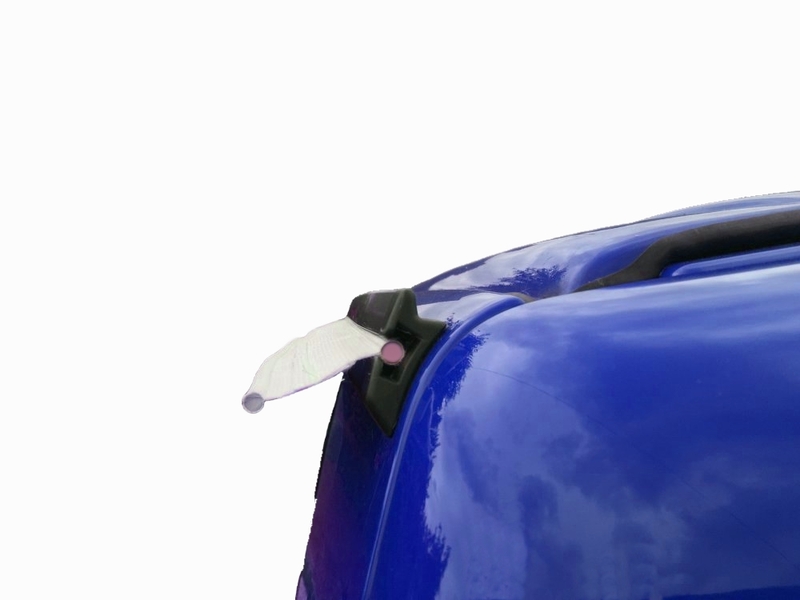 As the roof gully will already be used for the scissor hinge and gas strut brackets, the rail will need to be positioned more towards the edge of the roof or roof gully. 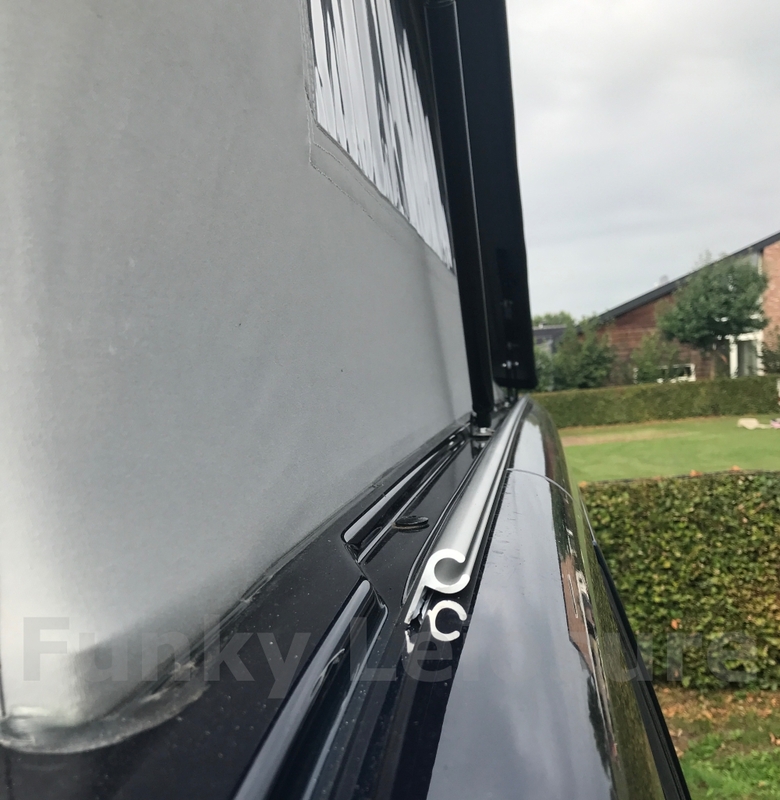 Depending on the type of roof you have fitted to your van, sometimes there is enough space to fit C-channel flat in front of the roof gully when the closed elevating roof extends to the very edge of the van roof. Alternatively, the rail can usually be bonded vertically along the outer edge of the roof gully and if necessary can be bonded on in sections (as in the photos of the blue T5) which is fine for threading a sun canopy into but will be a bit awkward to connect to a drive-away awning when using a drive-away kit. To bond the rail flat, follow the instructions below making sure the rail is positioned as far to the rear as possible while allowoing the elevating roof to close without obstruction. To bond the rail in the vertical position at the edge of the roof gully follow the instructions below concerning use of masking tape and adhesive. Ideally fit the rail in one continuous length, you can fit it in sections to avoid obstructions. The rail can still be bent to follow the curvature of the roof but this will take a lot more pressure with shorter lengths. It is a bit more tricky to bend the C-Channel Rail in an vertical position but still only takes a 5 minutes to get it close to the curve of the roof. Put pressure on each end of the rail simultaneously with a wooden block positioned in the middle/where needed… this is obviously easier to achieve with two people or with one end secured in a work bench vice. Offer the rail up to the roof 3 or 4 times to check to contour in between bending it a centimetre or so at a time. 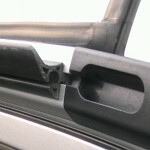 The rail can also be pop riveted into position if necessary as the fitting is concealed under the roof when closed. 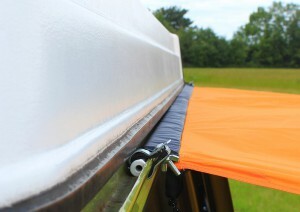 Many of our customers have fitted our C-Channel Awning Rail under their vans elevating roof. 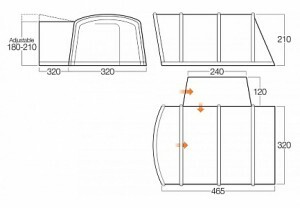 However, as there are so many different styles of Pop-Tops on the market, unfortunately we cannot give a definitive answer as to whether it will fit on individual projects. We recommend getting a C-Channel Awning Rail Sample before ordering a full length to make sure it will fit under your particular elevating roof. These instructions can be used to fit a C-Channel Awning rail to T4, T5 and T6 vans with an elevating roof. Lay the C-Channel rail either flat in front of the roof gulley or vertically on the outside edge of the roof gully in front of the hinge and gas strut as close to the rear door/s as the closed roof will allow. Mark the front and rear of the rail with a pencil roughly where the roof profile starts to curve downwards. Gently bend the middle section, front and rear of the rail where marked downwards 15/20mm until it matches the curved profile of the roof. This can be done on a bench over a wooden block with 2 people putting downward pressure on each end of the rail. Use Sikaflex 221 or similar automotive adhesive to bond the rail to the roof – apply a bead along the length of the gully and position the C-Channel rail. Masking tape can be applied at the edges and ends to mark the position and protect paintwork from excess adhesive. 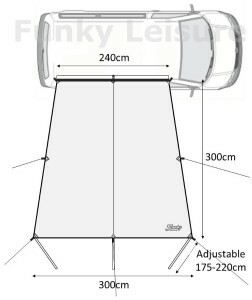 *Please note: it is important to position the rail towards the rear of the van so there is enough room for the sliding side door to open fully without snagging on the drive-away awning connection tunnel. Our C-Channel Awning Rail is high quality, German made, 3mm thickness anodised aluminium not to be confused with the cheaper thin steel caravan type rails on the market. The Kador insert gap is at the perfect angle and standard 6mm Ø core (7mm Ø overall) awning Kador slides along it nicely without snagging. We offer standard cut lengths for SWB and LWB VW Transporter T4, T5 and T6’s and custom cut exact lengths up to 300cm for deliver within the UK. 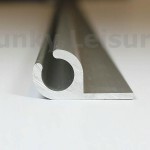 We also stock pre-cut lengths in two sections for European delivery. We’ve compiled the 2017 Vango AirBeam Drive-Away Awnings Comparison Chart to help VW Transporter owners make a more informed decision and choose the right Vango drive away awning for their needs. All models listed below are Low connection height versions which are best suited to fit Volkswagen Transporters. If you have a lowered or slammed Bus lower than the minimum recommended connection height, it’s still possible to connect and keep the fabric taught by just splaying out the side edges of the connection tunnel. *TOTAL AREA includes main living area, connection tunnel and porch. 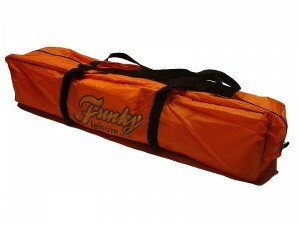 **PITCHING TIME is the time it takes for a well-practised, experienced operator to pitch the awning. 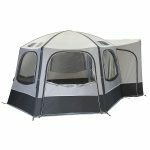 A quick overview of the new 2017 Vango AirBeam (AirAway) awning range along with a short review of the new Cruz drive-away awning. All the Vango awnings discussed below are the ‘Low’ connection height versions which are the best suited to fit VW Transporters. 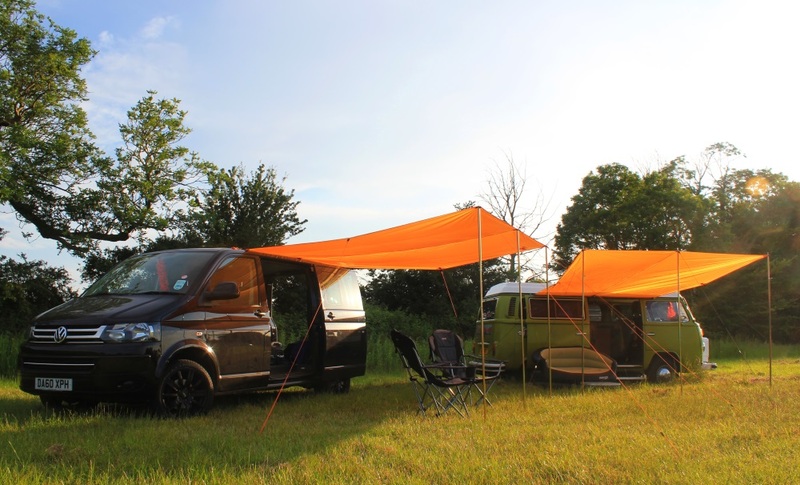 The ever popular Idris, bestselling Kela and awesome Galli awnings are all carried over from the 2016 season with just a minor change to the top of the connection tunnel, ‘clip-in’ as opposed to fixed front webbing straps and larger low level vents. Vango have now scrapped the roman numerals after the product names used to denote new upgrades in specification over the years, so instead of Kela II, Kela III etc… it’s just Vango Kela. New for 2017 is the Galli RSV (Right Sided Vehicle) which is a mirror image of the regular Galli. 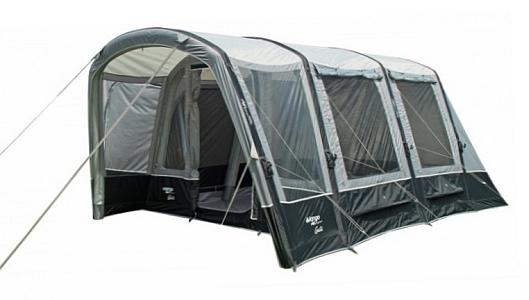 This awning has been specifically manufactured for left-hand-drive/twin sliding door vehicles so the front entrance porch of the awning faces out the same way as the front of your LHD Bus. 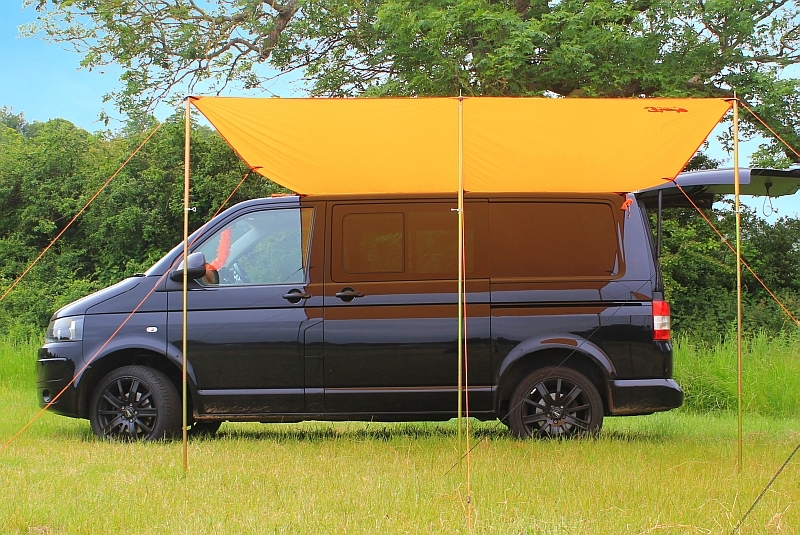 This is good news for the VDub scene as we have so many imported ‘Left-Hookers’ on the road, it’ll offer the many LHD owners the chance to get their hands on Vango’s largest drive-away awning and have it set-up in a front facing configuration. You really do need to sit and relax under your porch and reciprocate the admiring nods that the familiar front end of your Bus attracts! Alternatively, the Galli RSV can be used with a RHD van so the front porch faces out the same way as your rear tailgate kitchen. The new kid on the block for 2017 is the Vango Cruz which combines the excellent pre-angled SuperBeams and front porch of the Galli with the living area, pack size, weight and set-up time closer to that of the market leading Kela. The design has a large windowed living area in the middle that can accommodate a double bedroom and a 140cm deep connection tunnel that can be used as a utility room which provide the same floor area as a Kela plus the sheltered porch. The pre-angled SuperBeams provide additional stability and the extra headroom allows you to maximise this bright internal living space. 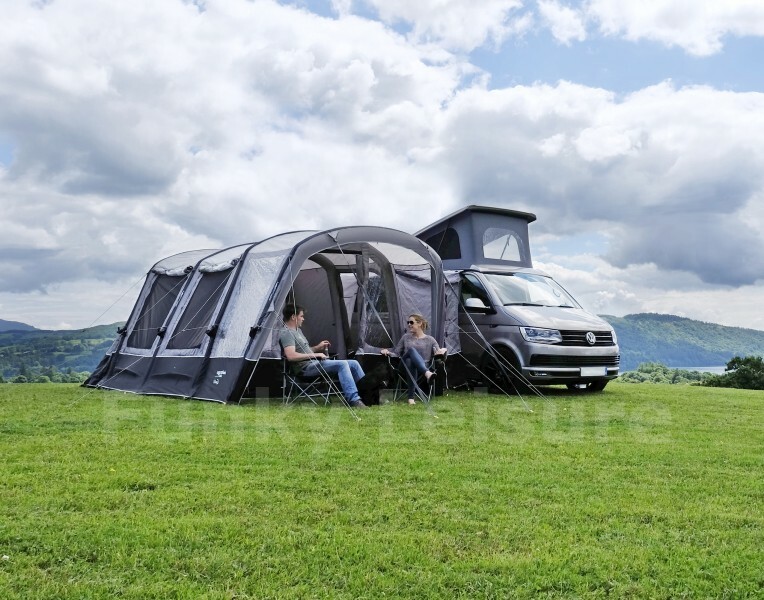 The popularity of the Galli in 2016 (its first year of production) was testament to its advanced design, high spec and comfort… we expect the Cruz to join the Kela and Galli as market leaders in 2017. 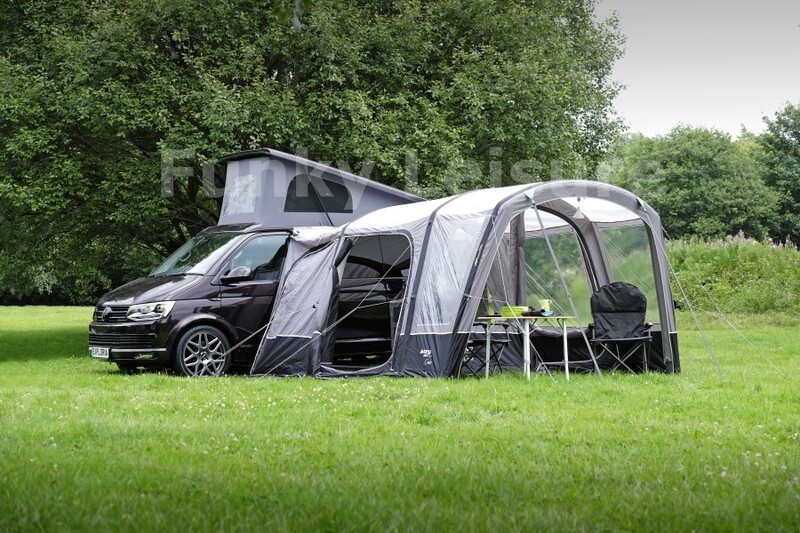 Overall the new Vango awning range caters for varying uses, family sizes and budgets that the VW community demands whilst, as always, offering superb design and build quality along with the customer support that people have grown to expect from Vango. Vango’s 2017 AirBeam range definitely gets the thumbs up from us! 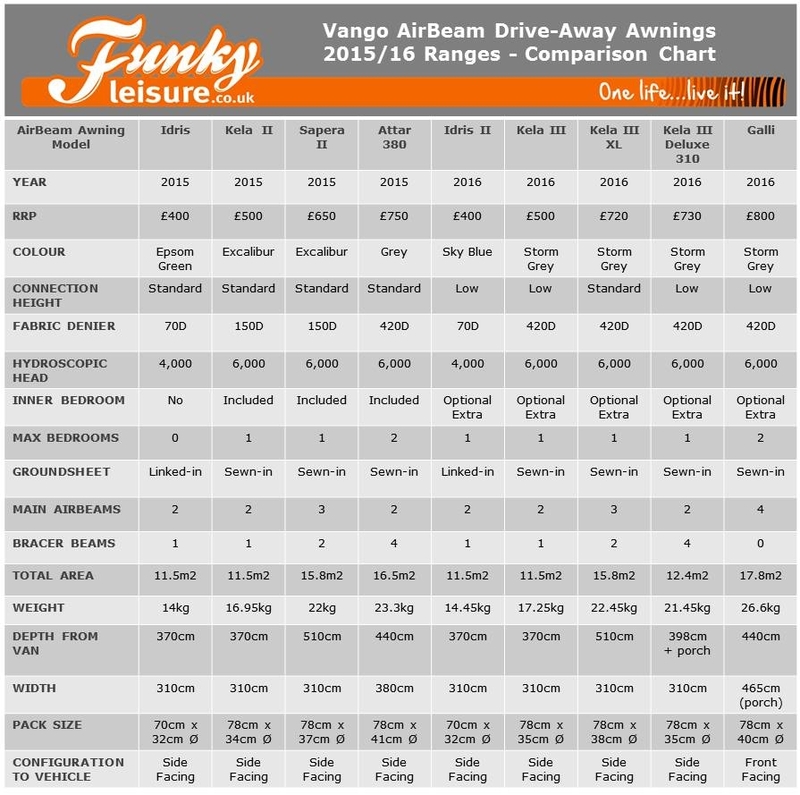 We get asked “what are the updates on the new AirBeam awnings?” and “what’s the difference between this year and last year’s AirBeam’s?” all the time here at FL – so we thought a 2015/16 Vango AirBeam Awning Comparison Chart showing specifications and dimensions would be the easiest way to answer. 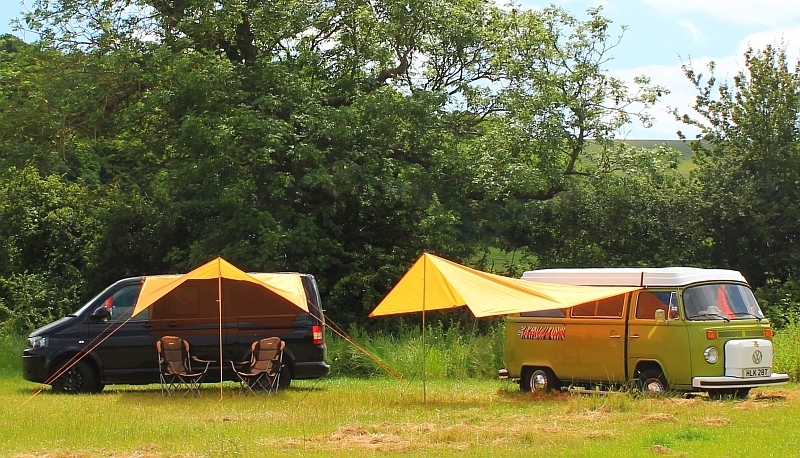 We run two VW Buses ourselves so appreciate the associated running costs, we also understand that a drive-away awning is a big outlay and VeeDubbers want the best suited design for their needs. We hope this chart answers your questions and helps you make an informed decision whether you’re buying new or upgrading from an older model. 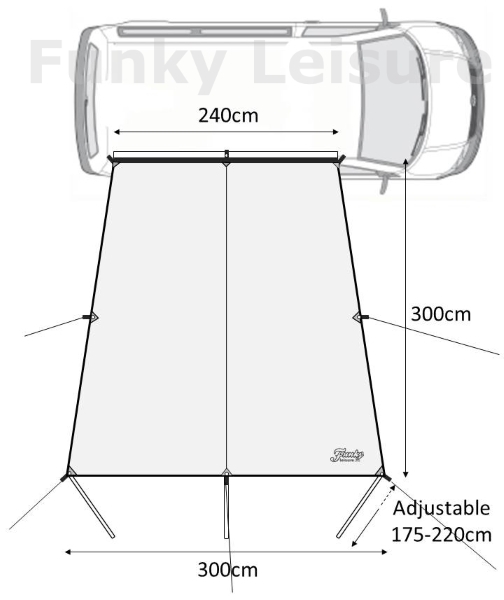 The Vango AirBeam Awnings shown in the chart below are past and present Funky Leisure stock that are the most compatible with VW Transporter Vans. 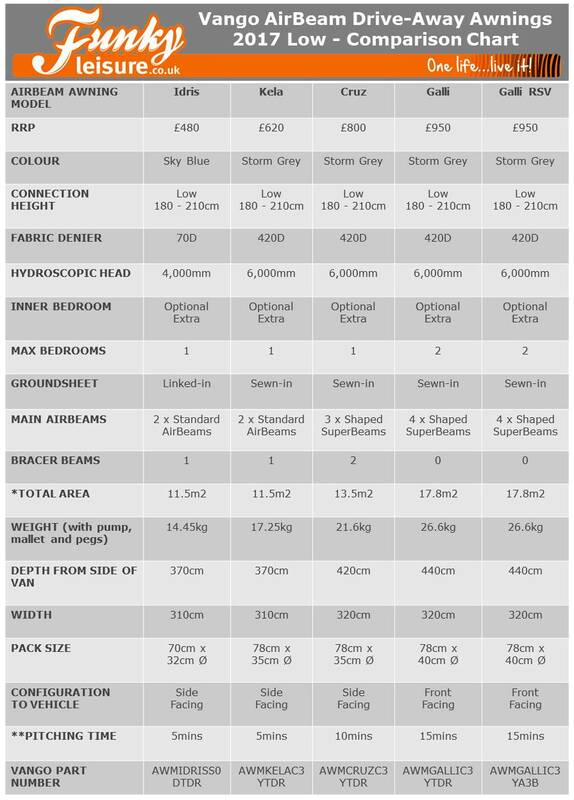 Use this comprehensive AirBeam comparison chart to compare RRP’s and colours through to pack size and total living area on past and present Vango drive-away awnings. For an up to date Vango AirBeam Drive-Away Awning Brochure email your address to info@funkyleisure.co.uk with ‘AirBeams’ as the subject title or visit our Vango AirBeam Awnings section to buy online with free next day delivery. This review is a basic overview of the new 2016 Vango AirBeam Drive-Away Awning Range highlighting new features and updates. We have only highlighted the AirBeam (aka AirAway) models that we consider to be the most compatible with VW Transporters. The ever popular Idris and market leading Kela continue as the base models in the new AirBeam range and for 2016 have been renamed the Idris II and Kela III respectively. As with last season, they both have identical dimensions and the floorplan sizes are also the same as last year, although the maximum head height is now 230cm slightly lower by 3cm across the whole range. 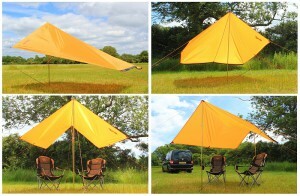 As with the first Idris, the Idris II is based on the Kela III but comes in a lighter fabric with a ‘linked-in’ (detachable) groundsheet, lighter/smaller pack size and a price tag £100 less than the Kela III. The Idris II now has connection tabs for an inner tent sleeping compartment if required. Both models are available in the new LOW connection height which we’ll discuss in more detail below. The Kela III XL is the extra-large version (the clues in the name) and has an additional main air-beam with bracer beam that offers extra living area. The Kela III XL is available in STANDARD height connection only. The Kela III XL has basically superceded the Sapera model from previous seasons and has the same floor dimensions. If you own an earlier model Sapera, the Kela XL footprint and carpet will fit perfectly or if you upgrade to the new Kela XL you could use your existing footprint and carpet. The Kela III Deluxe 310 comes with zip off front sun canopy and a porch over the side door, and this model has superceded last season’s Attar awning. The Kela III Deluxe 310 has a slightly shorter connection width than last year’s Attar 380 which means it will now fit a SWB VW T4, T5 and T6 as well as LWB Transporters. The Kela III Deluxe 310 is available in LOW and STANDARD connection heights. We can still order in (with 2 or 3 days notice) the Deluxe 380 for any customers that prefer an extra wide awning. 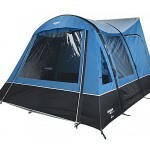 The Kela III Deluxe 380 is available in STANDARD height only. The Galli AirBeam Awning is a completely new design from Vango and the flagship model of the 2016 range – we like it a lot! It’s Vango’s first drive-away awning design to run perpendicular to the vehicle which means that the front of the awning faces the same way as the front your uber-cool VeeDub… obviously this would be the reverse on LHD’s offering easy access to the rear tailgate/barn doors. At the front of the Galli is the main entrance door with integrated porch, perfect for sitting out and watching everybody run for cover in a summer shower and an instant shelter while you unzip the door if you return in wet weather. 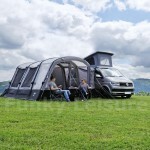 The Galli is also the first drive-away awning from Vango that can accommodate two double sleeping compartments with the layout still offering easy access to the connection tunnel and a decent amount of living area. 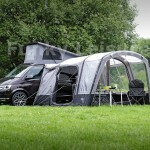 Call into our Twickenham showroom to see a Vango Galli on display and either connected to our 79’ Bay or T5. 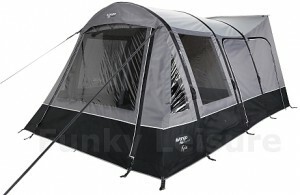 Vango have been a bit slow to offer the option of a lower connection height awning tunnel but better late than never. This hasn’t really put off VW owners too much as AirBeam awnings have been embraced by the scene since they were first introduced. It is possible to get a Standard connection tunnel nice and taught on a Transporter, it just takes a bit of practice. Vango have drawn on their 50 years of tent manufacturing experience and created new Sentinel high quality fabrics for their 2016 AirBeam awnings. The Idris II uses Sentinel Active 70 in its construction which is a 70 denier polyester combining strength to weight to provide a compact pack size. All other awnings in the AirBeam range are now manufactured using Sentinel Pro 420 – an incredibly strong 420 denier double rip-stop fabric that will withstand all weathers. 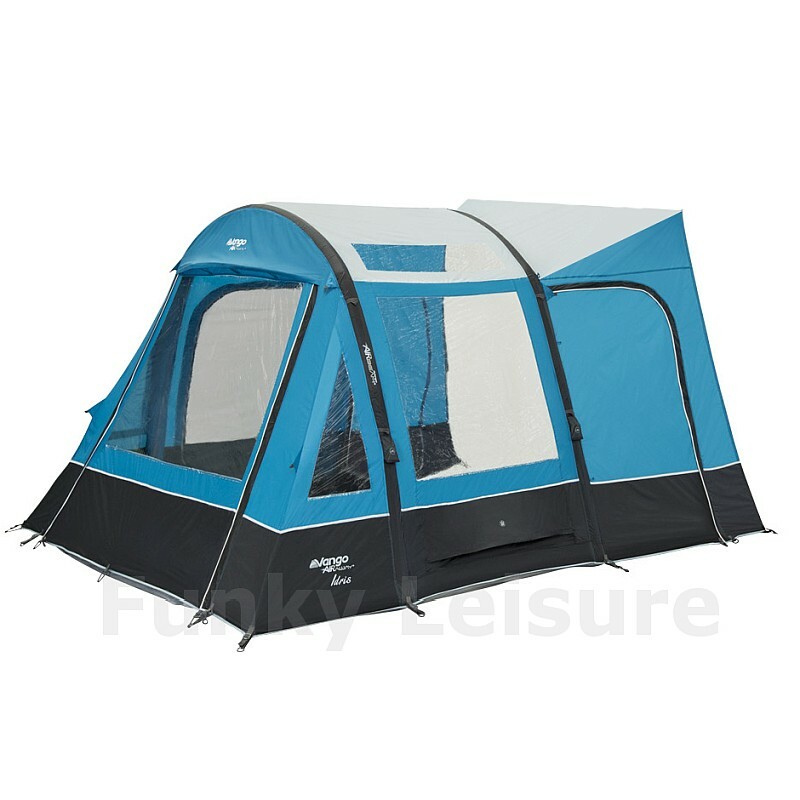 This high-density base fabric combined with high tech coatings ensure AirBeam awnings are durable, fully waterproof and will have a long life. The Idris II now comes in a cool Sky Blue colour with Black detailing with the rest of the collection finished in a much lighter Cloud Grey/Black colourway. 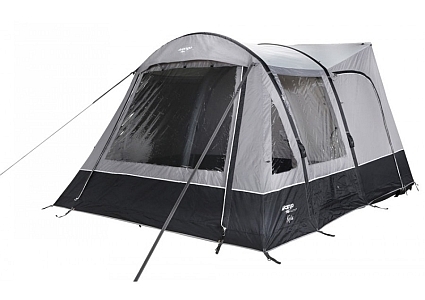 Bedroom inner tents aren’t included as standard with the 2016 range and they are now an optional extra. 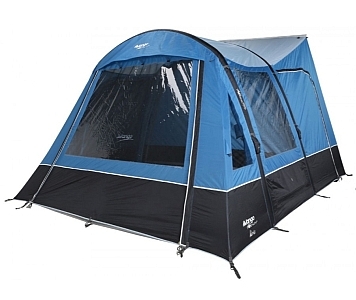 We can understand why Vango have done this as in past years many of our customers have bought AirBeam awnings for just living/storage space and the bedroom was surplus to requirements. The new universal double bedroom fits all 2016 models and is reversible. Vango have improved their AirSpeed Valve System by tweeking the pump adaptor slightly to make inflation 30% more efficient… which equates to 30% less effort or same effort and 30% faster inflation… yes, even faster! We do have a few of these new adaptors to give away to any of our 2015 AirBeam customers who call in our shop. All 2016 AirBeam’s still have Vango’s patented Tension Band System (TBS) which is what makes them the most stable drive-away awning on the market. 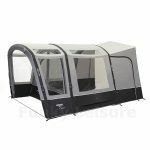 Just email your address to info@funkyleisure.co.uk with the title AirBeam for a FREE 2016 Vango AirBeam Awning brochure and pricelist.